Suitable for BOPP tape, PE, PET, masking tape, double-sided tape, foam tape, release paper and many other adhesive and non-adhesive materials. 1. Automatic length setting: the two-step length counter provides accurate rewinding length control. Once the set length is reached, a servo motor is adopted so that shafts will instantly and automatically changes, ensuring easy operation and efficient performance. 2. Programmable controller: the high performance programmable controller offers convenient control of the entire rewinding operation. Both length and tension are accurately displayed by LCD readout. 3. The paper core is held firmly on the pneumatic shaft. With easy, fast loading and unloading, it greatly improves efficiency. 4. Automatic smoothing device: this wipe down device fully eliminates the problem of wrinkling and air bubbles in the product after rewinding. This device further ensures the smoothness of product. 5. Hydraulic auto up-lifter device (optional): this device offers easy material loading for operational convenience and improves efficiency. 6. 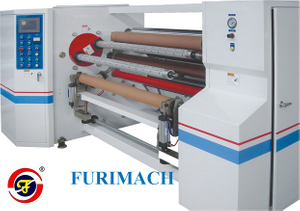 The pressing roller is controlled by the cylinder and the pressure is adjustable. The semi-finished products are properly pressed to ensure smooth, stable running during rewinding.